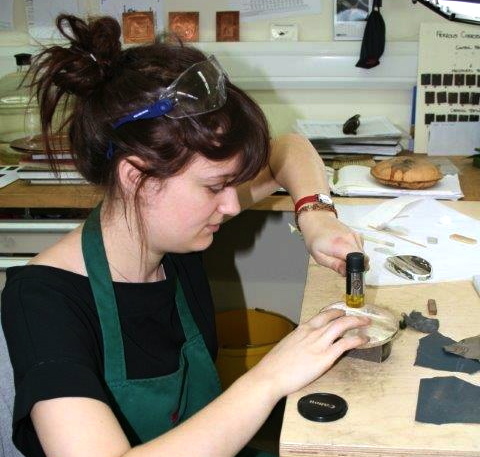 In 2012/13 Hannah Young received an Anna Plowden Trust Conservation Bursary towards her fees on the Postgraduate Diploma course in Metalwork Conservation at West Dean. Her course work included the conservation of a range of objects, which allowed her to carry out a variety of treatments. The projects included a pair of Dutch 17th century brass and iron ironands in the Baroque style, a 19th century Japanese dagger, a copper alloy drip pan, a pair of 1950's sterling silver backed hairbrushes and a Prussian Officer’s dress sword. Hannah found each project a valuable learning experience. Hannah undertook an internship at the V&A, where she was responsible for “the preparation of objects for a display of Malaysian silver… this included condition assessing and treatment of objects for display, liaising with technicians and curators to discuss proposed treatments and mounts as well as documentation and project support”. Hannah completed her course at West Dean in September 2013 and has since started a year’s internship at the National Maritime Museum in Greenwich.